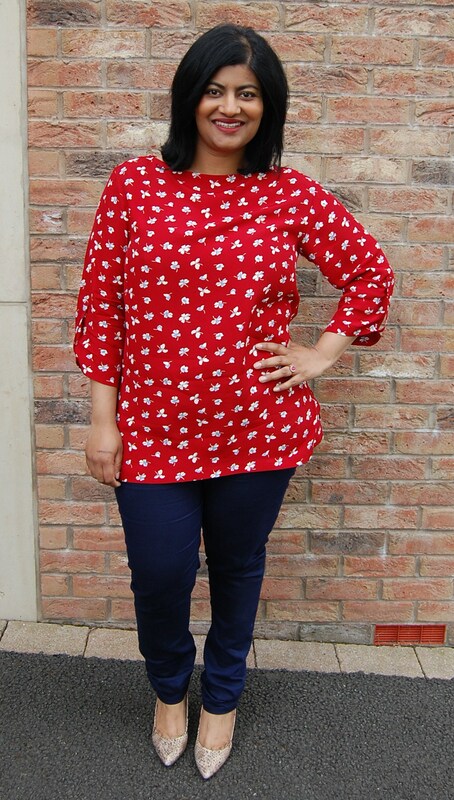 Simplicity 1364 – vintage button back boat neck top. Entered in Simplicity’s Star Sewist Contest 2015. Hope you are all doing fine, and enjoyed the long weekend some of us have had. Well, today I wanted to share Simplicity 1364 with you. As always you can check out my full pattern review below but first I have to fill you in on the back story as to why I have made this pattern up. Simplicity UK are running a contest to find a “Star Sewist”. You can read all about it here. Basically, there are three categories; dressmaking, vintage and newcomer. To enter one of the three categories you had to request one of the three pre-selected patterns chosen by Simplicity and they then sent the pattern out to you (for free). The closing date for entries is the end of this month. Surprisingly I didn’t go for the dressmaking category. If I am being perfectly honest I wouldn’t have chosen to sew any of these three patterns up for myself, so it was a case of chosing a pattern I felt I would be comfortable wearing. So that is why, shock, I went for the vintage category. I figured it would be the pattern I could make most feel like me. I think, after much fiddling with the pattern, I did end up with something wearable, for me. (In fact it has already been worn). It is more of a tunic now, with side vents, and I think the button back adds some interest. Sorry, but this fabric (viscose) is not the easiest to photograph details on. Also, I went for pale blue buttons which are also quite hard to spot amongst the cream/ pale blue flowers. 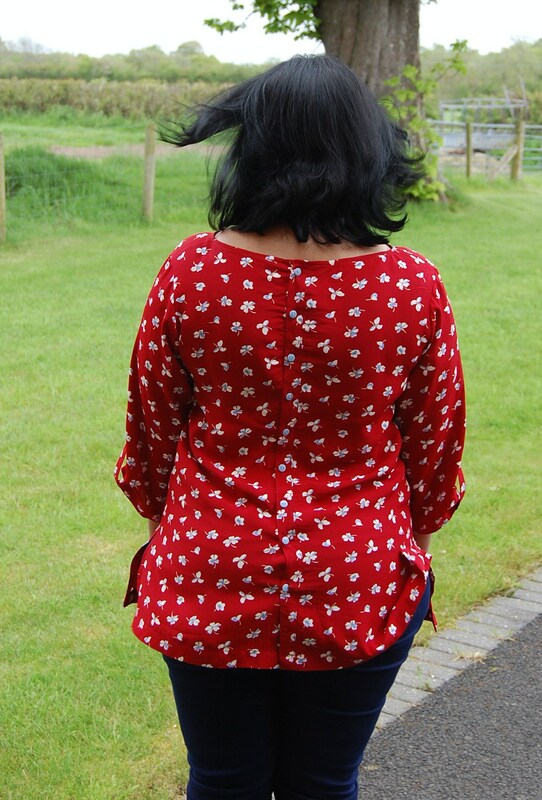 Simplicity 1364 – vintage button back boat neck top. Entered in Simplicity’s Star Sewist Contest 2015. 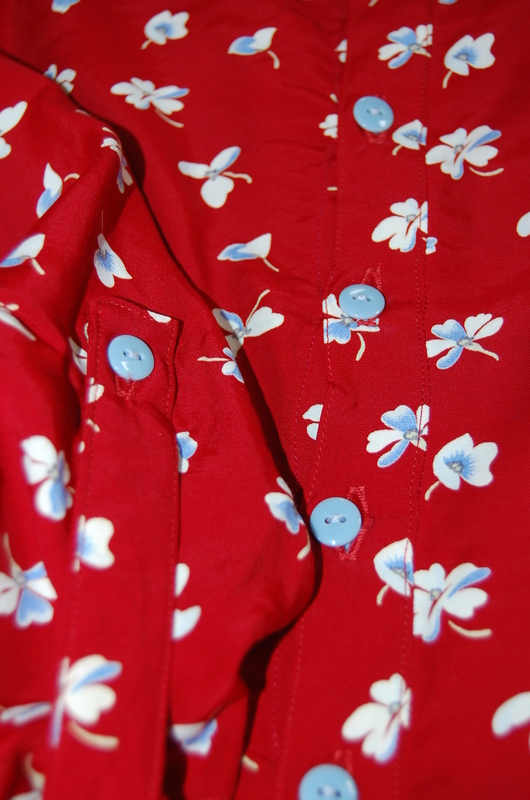 Close up of button back placket and sleeve tabs. 1960’s vintage Jiffy top is simple to sew and has three miain pattern pieces.Top has back zipper, bateau neckline, french darts and can be sleeveless or can have below elbow length sleeves. I am being honest when I say, were it not for the contest, and being provided this pattern by Simplicity, I probably wouldn’t have sewn this pattern up. It is vintage in style (which is not really my thing) and it is relatively short. However, with the modifications that I made I do like the finished top (and have already worn it), although if I made this pattern again I would lower the front neckline a smidge, make the hips a tiny bit looser and shorten the length of the sleeve tabs. Note that most of these tweaks are my own personal taste and not a reflection of the pattern per se. A vibrant floral printed viscose which would be beautiful for a vintage style dress (or top). I bought this fabric locally to me. I added approx. 5.5 inches to the length of this top to make it more of a tunic length. I did a 1 inch sway back adjustment. I had to add approx. 2.5 inches to the side seams of this top at the hips to make it fit. I shortened the french darts by 1 inch. I omitted the facings and substituted bias facing strips. I lengthened (and widened) the sleeves and omitted the elbow darts and added sleeve tabs with buttons. I removed 5/8ths inch from the centre back on either side and then added 2 inches to the left centre back seam (to fold over by 1 inch twice, and stitch down), and added a buttonhole placket to the right centre back seam. I added buttons/ buttonholes rather than a zip. All insides were overlocked to finish. I don’t know if I would sew again, but if I did I would tweak as mentioned above. If dressing like Audrey Hepburn is your thing then go for it. 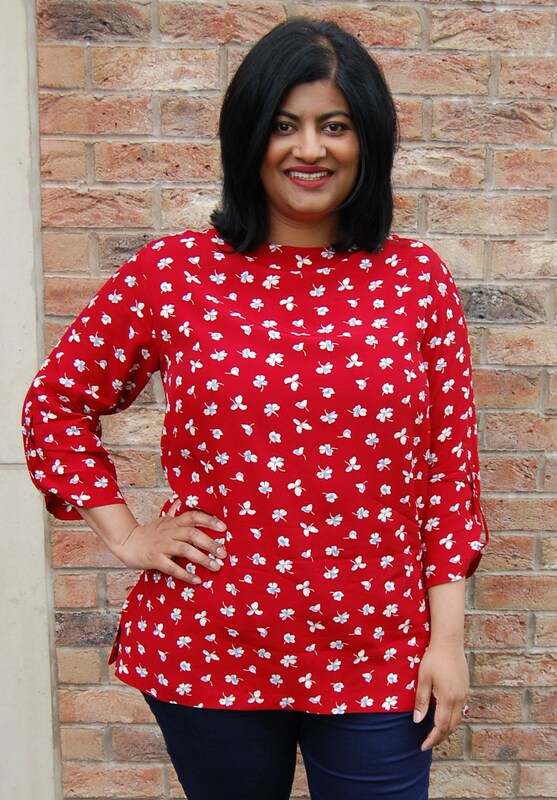 I don’t have any regrets about sewing this pattern up, although it’s a departure from my normal pattern selection and style, and it does need a little more refinement, it’s an eyecatching top with some interesting details to have in my wardrobe. The results for this contest will be announced at the beginning of July, and are decided by the judges. Red really suits you. I think it looks great! I’m not much of a vintag(y) person either but, this top is really cute and lengthened a bit more it would be a really cute spring dress. Great Job! This is a great color on you and the styling is very on trend. Your blouse looks great. I like the styling. I don’t see vintage, I see a great look. 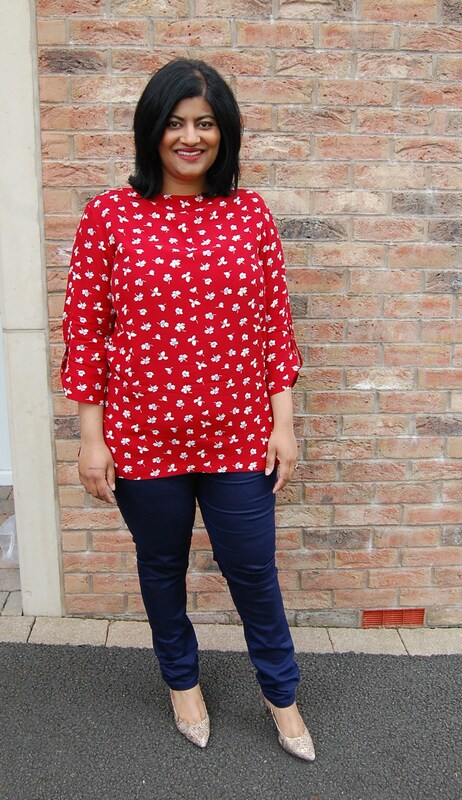 This is a really cute blouse, love how you styled it! 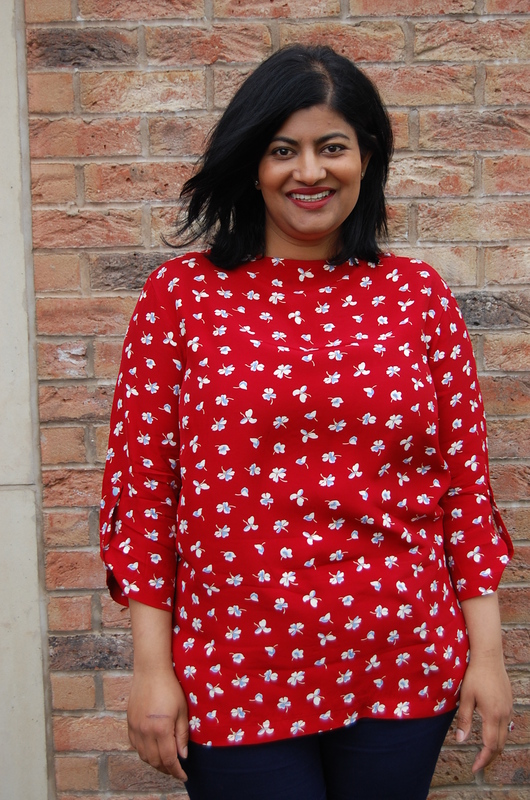 Lovely top Manju, and may I say, you look stunning in red! That’s absolutely lovely on you. You wear red very well. Button backs are a lovely design feature. This red is gorgeous on you! Good luck with the contest! Beautiful top and color! I love the vintage look. I have peeked on your page a few times, and your sewing work is awesome! A lovely bright and cheerful top. I like the fabric print and the design of the button back. Red and white is such a good combination. You wear this top so well that you should make another one! You look lovely in red, and the style suits you, superb make!